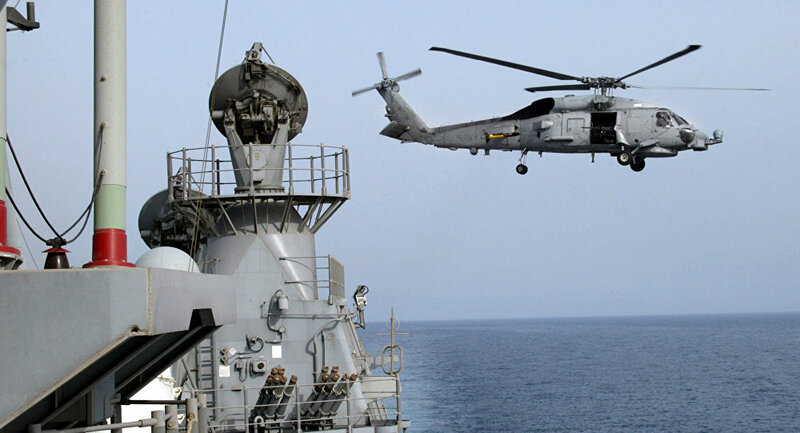 An Iranian vessel has aimed their weapon at a US Navy helicopter during an encounter in the Strait of Hormuz on Saturday. The incident is being described as “unsafe and unprofessional” by US Defense Agencies, Reuters reports. The encounter took place as the US SH-60 helicopter was flying over international waters and had reportedly flown within a half mile of two Iranian vessels. Deciding that the helicopter was too close, one of the vessels then fixed their weapon on the aircraft. The unnamed officials who spoke to Reuters stated that those on the aircraft did not feel threatened by being in the line of fire. The officials noted that if they had felt threatened, they could have been lead to retaliate, making the actions by those aboard the Iranian vessel extremely dangerous. The Strait of Hormuz is the home to approximately 40% of the world's oil tanker traffic, Sky News reports. Iran has previously threatened to close off foreign access to it in tense times, but has never actually followed through.